Wilbur Norman (‘Chris’) Christiansen was an innovative and influential radio astronomy pioneer. The hallmarks of his long and distinguished career in science and engineering, spanning almost five decades, were his inventiveness, his commitment to, and his success with, large-scale projects. These projects were the outcome of his innovative skill as a physicist and an engineer. Paralleling this was his equal commitment to forging strong international links and friendships, leading to his election as Vice-President of the International Astronomical Union from 1964 to 1970, as President of the International Union of Radio Science, URSI, from 1978 to 1981 (and subsequently as Honorary Life President in 1984), and as Foreign Secretary of the Australian Academy of Science from 1981 to 1985. Major subsequent developments in radio astronomy and wireless communications on the global scene stand as a legacy to Chris’s approach to his work and to the development of those who worked with him. Wilbur Norman Christiansen (‘Chris’ to everyone) was born on 9 August 1913 in the Melbourne suburb of Elsternwick, where his father was the minister of the local Congregational Church. Chris’s grandfather, Jens Christiansen, came from Denmark as a teenager, jumping ship in Melbourne and walking to the goldfields. Chris’s father was one of eight children. He went to the one-teacher school at Three Mile and later to Beechworth College, in the north-east Victorian goldfields. He earned money around the goldfields by tutoring. Later he returned to Melbourne, worked at the Public Library and did a university course. He later studied theology and became a clergyman. He completed his school education at Caulfield Grammar School where the headmaster had offered the family free tuition. He was a keen hobbyist and an inventor from an early stage and proudly described an early invention, as a schoolboy, that allowed one to write five lines at a time when given 100 lines as a punishment. He became secretary of both the school’s camera club and the radio club. ‘As I walked to the University each morning through a rather poor district I saw people and their furniture being ejected from their houses. My early Christian beliefs that had not been buried by my now complete unbelief in the supernatural made me react very strongly. I joined the University Labor Club, which was very much to the left of the Labor Party, and became very active in this. We published a journal called ‘Proletariat’ and also a weekly news sheet and joined marches of the unemployed and were ridden down by the mounted police. Chris graduated BSc in 1934 and MSc with First Class Honours in 1935, both from the University of Melbourne. He was awarded the Dwight Prize in Physics in 1931, which he said paid for his books and the Kernot Prize in 1934. While a postgraduate student at Melbourne in 1935 he discovered, with Crabtree and Laby, that ‘light’ and ‘heavy’ water could be separated by fractional distillation, indicating that special measures must be taken in purifying water prior to analysing its isotopic content. ‘Heavy water (D20) had recently been discovered and it was already known that deuterium could be separated from hydrogen by fractional electrolysis. For that reason old alkaline batteries that had been charged for many years had an electrolyte rich in deuterium. Such was available in cable-tram batteries in Melbourne and I was given the job of collecting supplies of this electrolyte and by further electrolysis producing water with a very high component of heavy water. A second part of the work was to produce water almost free of deuterium and by a very sensitive density measurement to find the proportion of deuterium in natural water. This work was highly dangerous. All the gases from the electrolysis of water were collected together and forced through a nozzle and the jet set alight. If the nozzle velocity fell below the burning velocity the flame could go backwards into the electrolysis chamber and a huge explosion might occur. Professor Laby had designed a device which allegedly reduced the size of the nozzle if the pressure fell and kept the jet ‘ velocity high enough for safety and avoided having to replace one blown up research student by another one. I was suspicious of this and worked out the theory and found it would not work. I gave my calculations to the professor who angrily tossed them away and suggested that I might take up some other branch of scientific activity. I meekly said that I would try his device. I would attach it to an inflated balloon filled with the Oxy-hydrogen mixture and light the jet. As the gas escaped and was burned the pressure would fall and we would see how the safety device worked. I set this up in the basement of the Physics school, lit the jet and ran upstairs. In a few minutes there was an enormous bang that caused great excitement throughout the building. I was then allowed to use my own safety device which was simply a jar of sand between the jet and the source of gas. I got a prize for my MSc work rather than either death or the sack. Chris’s research career was on its way. In 1953, by which time he was working with CSIRO, he submitted his collected papers of the time and was awarded a Doctor of Science degree by the University of Melbourne. In 1937, after completing a two-year appointment as Assistant Physicist with the Commonwealth X-ray and Radium Laboratory, he got a job at Amalgamated Wireless (Australasia) Ltd (AWA) in Sydney where he joined Geoffrey Builder and AL Green, pioneers in ionospheric physics research, on improving the ‘Beam Wireless’ system and particularly on the design of stacked rhombic antennas for overseas short-wave communications. He made an important contribution to securing Australia’s international wartime radio communication linkages, and his experience in this area was also valuable in his later roles in CSIR. Published in the ‘AWA Technical Review’, this work appeared subsequently in the CCIR (International Radio Consultative Committee) ‘High Frequency Directional Antennae’ handbook and was widely referenced. The Overseas Telecommunications Commission, AWA’s postwar successor in operating the short-wave services, made extensive use of the designs. As Chris recalled: ‘I got five bob for my invention’. Chris was very proud of his ‘ecumenical’ role, in the 1940s, in arranging to have radio stations 2CH (the Protestant station) and 2SM (the Roman Catholic station) broadcast from the one antenna at Carlingford, an outer suburb of Sydney. He was able to apply the same approach of sharing antennas between stations in a number of locations in New Zealand, helping AWA’s position in that market considerably. Chris had a long-standing interest in astronomy and, in 1948, he wrote to the Radiophysics Division of the Council of Scientific and Industrial Research (CSIR, later CSIRO), enquiring about positions and was offered one in Joseph Pawsey’s group working on radio astronomy. Chris enjoyed the benefits of joining an environment that been fostered by CSIR’s longstanding Chief Executive Officer, David Rivett : ‘get the best people possible, give them the needed resources and let them run free’. As Chris pointed out, in practice resources were never plentiful, but the freedom and encouragement were there. Chris was appointed to a senior role within Radiophysics and was soon the leader of the solar research programme at the newly established field station at Potts Hill in the western suburbs of Sydney. Chris organized observations of partial solar eclipses with DE Yabsley and BY Mills at a wavelength of 50 cm in 1948 and with Yabsley at a wavelength of 25 cm in 1949. These observations showed that regions of the Sun of high radio emission (associated with sunspots) had dimensions of about one-tenth of the solar diameter. Solar radio brightness distribution – The above discovery and Chris’s frustration at the inefficiency of depending on eclipses for measurements led to the development of the ‘grating array’ that achieved high resolution as a result of its length and produced multiple responses on the sky separated by a number of solar diameters. The first grating telescope at Potts Hill (1951) allowed the distribution of radio brightness across the Sun to be studied as the sun drifted through the responses during the day. It was found that the enhanced emission at 21 cm came from regions in the lower corona of the Sun. Their dimensions and height above the photosphere could be determined for the first time. A second investigation concerned the background or ‘quiet sun’ radiation at 21 cm. David Forbes Martyn had predicted ‘limb brightening’ but the Cambridge radio astronomy group had conducted observations that discounted the possibility. Chris, with JA Warburton, observed limb brightening with early experiments using an east – west array. They later made use of two gratings, one in an east – west and one in a north – south direction, to observe the Sun from dawn until dusk to obtain the two-dimensional brightness distribution. This showed marked limb brightening in the equatorial zones but none at the poles. The method that was used for this showed a lot of ingenuity. The scans produced as the sun drifted through each grating response (one-dimensional pictures of the Sun known as ‘strip scans’) were Fourier-transformed to produce a radial line of points with an azimuth angle equal to the scanning angle across the Sun. This angle changed during the day with the rotation of the Earth. At the end of this stage of processing, they had sets of points on radial lines covering a good part of a circular patch in the centre of the Fourier plane. One of the issues at this stage is that the density of points is inversely proportional to the distance from the centre, giving undue weight to broader features and low weight to finer features. This could be corrected by weighting the points on each line. The approach they used to form the final image involved producing strip scans across this set of radial data points. They simply summed the values under a strip moving at a fixed angle across the data. This was again Fourier-transformed, resulting in a radial line back in the ‘image’ plane. The set of radial distributions was then used to create a two-dimensional contour map. This process was carried out at enough angles to give the detail required in plotting contours for the final image. This involved laborious hand-calculation and took months of effort to produce an image, shown in Figure 1. Figure 1. The first earth-rotational synthesis image showing the derived two-dimensional radio brightness distribution with a peak Tb of 6.8e4K and the central value of 4.7e4 K.
This approach was the first known application of earth-rotational synthesis and produced for the first time a radio map with a resolution as fine as 4 minutes of arc. All we knew was that this had been seen with a fixed aerial when the MilkyWay went through. With Jim Hindman as my assistant I got stuck into this very rapidly, using all sorts of old junk that we could collect. We did have to make up one special bit of instrumentation. Within six weeks we confirmed that the radiation was coming from the Milky Way, but we went further and mapped it all over the Milky Way, showing that in fact it had exactly the same shape as the Milky Way. Moreover, because we were doing it in a special way, we were able to show there were spiral arms in our galaxy ‘ the first radio evidence that we were living in a spiral galaxy. Chris and Jim Hindman continued with their crude equipment. They had not only confirmed the discovery of 21 cm radiation from groundstate hydrogen in space but had made the first survey of H-line emission from space, obtaining the first radio evidence of the existence of spiral arms in our Galaxy, the Milky Way. Fleurs and the ‘Chris Cross’ – After a brief period at the Meudon Observatory in France Chris returned to the Radiophysics Laboratory, and started on a new project. A new instrument, which combined the grating approach from Potts Hill with the Mills Cross principle conceived by Bernard Mills, was subsequently built at the CSIRO Fleurs field station. Known as the ‘Chris Cross’, the telescope provided daily two-dimensional maps of the Sun with a resolution of 3 arc minutes from 1957 onwards. These maps were built up by scanning with a pencil beam to produce a ‘raster scan’ where the beam moved up one step at a time as the Sun went through successive grating lobes with the rotation of the earth. It was the first of a number of similar instruments built around the world. In the late 1950s, there were big arguments within Radiophysics on whether future needs should be met by array telescopes or by a big dish. Joe Pawsey, Chris and Bernard Mills favoured arrays while Taffy Bowen wanted a big dish. Pawsey, Chris and Mills all left, Chris and Mills going to the University of Sydney in 1960, to Chairs in Electrical Engineering and Physics respectively. Chris did not take up his post immediately but first spent fifteen months at Leiden University, at the invitation of Professor Jan Oort, as the leader of an international design team for the 400MHz ‘Benelux Cross Project’ working with the Swedish astronomer Jan HÃ¶gbom. When the Belgians pulled out, the Benelux project was abandoned for what ultimately became the Westerbork Synthesis Telescope. Chris maintained an active collaboration with the Dutch group developing the new telescope. Jan HÃ¶gbom also played a key role. The book ‘Radiotelescope’ that HÃ¶gbom and Chris wrote together was published by Cambridge University Press in 1969 with a Russian translation by Yuri Ilyasov appearing in 1971 and a Chinese translation by Chen Jian-Sheng in 1977. In the period since Chris had taken up his appointment at the University of Sydney, Martin Ryle at Cambridge had demonstrated a full rotational synthesis system and embarked on the design of the Cambridge One Mile Telescope, while the Dutch had decided to proceed with a synthesis telescope at Westerbork in place of the original Cross concepts. Chris saw the opportunity for a significant and challenging project and set about changing the arms of the ‘Chris Cross’ instrument to convert it from one of low sensitivity and 3 arc min resolving power, designed for solar observations, into a high-resolution rotational synthesis telescope at roughly the same wavelength of 21 cm as the previous Fleurs crossed multielement interferometer. As the Fleurs Synthesis Telescope, it would be used for galactic and extra-galactic astronomical observations in the years 1973-1988. The Fleurs Synthesis Telescope (FST) was built utilizing the infrastructure of the Chris Cross. The compound interferometer at 1415 MHz or 21 cm was formed by multiplying each of 5.8-m elements of the original Chris Cross by two new 13.7-m antennas on the E – W and N – S arms with a total baseline of 800 m. Astronomical sources could be tracked for eight hours per day. With this combination, roughly circular beams could be achieved from the celestial equator to a declination of âˆ’80 d. The resolution was 40 arc sec after two times eight hours, once with the E – W array and once with the N – S array. During its years of operation, the FST provided the highest-resolution radio telescope (apart from long-baseline Interferometry) in the southern hemisphere. The FST is shown in Figure 2. Figure 2. A view along the array of the Fleurs Synthesis Telescope in 1973. (ATNF, Historic Photographic Archive, 9097-11). Over a period approaching twenty-five years, the FST was an important test-bed for PhDs in Electrical Engineering and a training ground for numerous scientists who have played major roles not just in radio astronomy but in Australian industry, universities and the CSIRO. Chris had a strong belief in the benefit for students of working on large complex projects in a team environment, and their subsequent success is a significant tribute to him. During this period, the FST produced numerous radio images and astrometry at the arc sec level; the success of these research endeavours was a major stimulus to the planning of the Australia Telescope (AT) that began in the early 1980s. The FST was a ‘hands on test bed’ for many of the concepts that were later used at the AT. An additional indirect influence was the pronounced impact of the FST on the Australian astronomical community; the breakthroughs brought about by high-sensitivity, high resolution radio images showed the need for a high-resolution multi-frequency instrument. Starting in 1975, the FST was in full operation at 21 cm in the continuum, with a large number of observations completed with the E – W arm. In late 1975, the N – S arm came into operation. For most fields the final observational product consisted of two eight-hour observations with the E – W and N – S arms. Circular beams were possible over most of the southern sky. For the next thirteen years, the FST was used extensively by more than seventy-five scientists to publish sixty-nine papers, details of which are reviewed in the memoir by Bob Frater and Miller Goss (see Source below). Air Navigation Work – In addition to the work in radio astronomy, and as a further step in establishing challenging projects for postgraduate work, Chris established a research group to tackle problems in the radio navigation of civil aircraft, initially led by Robert Redlich. It was later led by Godfrey Lucas, who with his group developed significant improvements to the Instrument Landing System (ILS) and Vector Omnirange System (VOR). This group earned a considerable reputation internationally. Chris took on significant roles with the international scientific unions. His involvements with both the International Astronomical Union and the International Union for Radio Science began in the 1950s. He served as a Vice-President of the International Astronomical Union (IAU) from 1964 to 1970, President of the Radio astronomy Commission of the International Union for Radio Science (URSI) from 1963 to 1966, Vice-President of URSI 1972 to 1978 and then President from 1978 to 1981. He was appointed a Life Honorary President of URSI in 1984. He was a member of the General Committee of the International Council of Scientific Unions (ICSU) from 1978 to 1981. 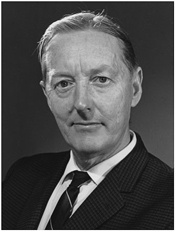 In the Australian Academy of Science, to which he was elected in 1959, he was Foreign Secretary 1981–85, served on the Council for two terms, and was chairman of several committees including the National Committee for Radio Science, 1962 – 70. He was President of the Astronomical Society of Australia, 1977 – 79; a member of the Australia-China Council of Australia’s Department of Foreign Affairs, 1979 – 82 and a UNESCO Consultant in India on the construction of a ‘Giant Equatorial Radiotelescope’ in the 1980s. Chris had extensive scientific linkages, both local and international. He was always looking to involve young engineers and scientists in the work of international bodies, leading to Bob Frater finding himself, at the age of 32, as the Commission D representative for Australia on URSI. Chris actively recruited young representatives to Academy committees and the like. His long involvement with both the IAU and URSI, together with his many interactions with peers around the world, gave him an extraordinary international network. This came into play over the years in arranging visits, finding post-doctoral positions and so on. My interest started in about 1920 through an aunt who was matron of a missionary hospital in China. I later read a book called Red Star over China, by Edgar Snow, and became still more interested. ‘They said they would be glad for me to go as their guest, and give lectures and so on. They’d read everything I had ever written, I think. After that the connection just increased, because while I was there I met the President of their Academy and I suggested that he ask our Academy to send a delegation to China. A delegation did go, probably in 1964, and in return a Chinese one came to Australia. When Chris visited China in the early 1960s he assisted an embryonic radio astronomy group that was struggling with some copies of Russian solar radiometers. The group was interested in building a solar array but lacked simple things like cables. Chris was able to draw on his earlier experience to help them with open-wire transmission lines. He formed a strong friendship with Wang Shouguan. Wang and Wu Huai-Wei visited Sydney in 1964. The group at Fleurs collaborated in the development of the new telescope at Miyun Observatory. Chris made many visits to China over the years, while Chen Hong-Shen and Ren Fang-Bin visited Fleurs in 1974. Chris organized lecture tours and visits to the Miyun group by Bob Frater in 1976 and Miller Goss in 1977 and Chin Kwong visited China in 1979 as part of that collaboration. Chen Jian-Sheng and colleagues visited Australia in 1979 to observe at Fleurs. In recognition of his ‘long and important contribution to Chinese astronomy’, Chris was elected a Foreign Member of the Chinese Academy of Sciences in 1996. On retirement in 1979 from the Chair of Electrical Engineering at the University of Sydney, Chris was given the title of Professor Emeritus. He was a Visiting Fellow at the Mount Stromlo Observatory of the Australian National University from 1980 to 1985. He died on 26 April 2007. Those involved with the Fleurs Synthesis Telescope, as staff members (as Bob Frater was) or as postgraduate students, learned a lot from the process of developing the instrumentation necessary for an operational telescope. When Frater went on to run the Division of Radiophysics and to build the Australia Telescope, these people played an essential role, and even today they are playing key roles in the developmental work for the Square Kilometre Array. The success here is part of Chris’s legacy. The challenge of the work at Fleurs and the team environment created by Chris yielded other benefits that also stand as his legacy. Key parts of the Wireless LANs work that led to the formation of the company Radiata, that has delivered such handsome royalties to CSIRO, was done by people ‘ John O’Sullivan, Graham Daniels and Terry Percival in the patent process and David Skellern in the commercialization who went through this system as students. Following the success of this project, Bob Frater prepared a presentation titled ‘Rome Wasn’t Built in a Day’ to emphasize the linkages back to Chris Christiansen’s Fleurs vision and the many other significant outcomes that have resulted. In addition to his significant influence in the development of the Westerbork Synthesis Telescope, Chris’s influence on the development of radio astronomy in both India (with the links to Govind Swarup) and China (with Wang Shouguan) is inestimable. Chris truly carried the high status that Australia enjoyed in the early days of radio astronomy through to the present day through the training and experience that came out of Fleurs. In addition to the PhDs in Electrical Engineering, a smaller number of PhD degrees were awarded in astronomy through the University of Sydney’s School of Physics and the Australian National University. Numerous collaborations were established between the University of Sydney (Electrical Engineering and the School of Physics) and other astronomical groups in Australia (CSIRO Division of Radiophysics, Australian National University and the Anglo–Australian Observatory), associations that have continued well into the new century. Major instrumental innovations that had an impact on radio astronomy. Earth rotational synthesis was achieved in 1955 with the Potts Hill grating array. A few years later, the crossed-grating multi-element interferometer at Fleurs was completed, an instrument based on the twin concepts of the grating array as had been used at Potts Hill and the Mills Cross technique of correlating two orthogonal arrays. After Chris’s move to the University of Sydney in 1960, the establishment of a remarkable group in Electrical Engineering led to the Fleurs Synthesis Telescope. The pioneering HI line work in the first years of 21 cm hydrogen spectroscopy, starting in 1951. This work showed the existence of spiral arms in the gaseous component of the Milky Way; the southern Galaxy was imaged contemporaneously with imaging of the northern Milky Way by the Leiden group. The outstanding work on galactic and extra-galactic astronomical observations using the EW and NS grating arrays at Potts Hill from 1952 and the crossed multi-element interferometer at Fleurs starting in 1957. He published one book (translated into Russian and Chinese) and 51 scientific papers including eight in the highly prestigious international journal Nature. Frater RH, Goss WM, 2012, ‘Wilbur Norman Christiansen 1913–2007’, Historical Records of Australian Science 22(2): 215 ‘ 228.